Letters to a Young Contrarian sees Hitchens address the idea of a life lived in opposition through a series of classically acerbic, witty, and superbly written essays, styled as missives to a young protégé. For Hitchens, the essence of a dissident or a dissenter is the ability to think independently and not be swayed by the majority. He argues that this quality, and the capacity to resist, is innate within everyone. He asserts that we do not “naturally aspire to some hazy Nirvana, where our critical and ironic faculties would be of no use to us”, and that such a state of “endless praise and gratitude and adoration” would be one of “hellish nullity and conformism”. Indeed, abandoning our critical faculties, or submitting them to a state of ignorant bliss, would be to “summon a vision of tedium and pointlessness.” Thus, he advocates the virtues of argument, of distrusting things like superstition and unchecked authority, in favour of a skeptical mentality, which he believes is as important for the dissenter as any armor of principle. He admits that we may be, in our daily lives, faced with situations of bullying, bigotry or the like, and invites us not to put up with them, to act “as if” they need not be tolerated and are not inevitable, alluding here to Vaclav Havel’s “Power of the Powerless” tactic against the oppressive government at the time. Still, he recognizes the temptations to abandon, or at least avoid, such a mode of conduct, and encourages us to be alert to giving in to them, when we haven’t the energy to combat arguments against passivity and mindless obedience, especially without having meant to do so. As can be surmised, Hitchens polarizes his readers almost without exception, because his stances and views are themselves anything but middle-of-the-road or pedantic. His views on religion, which is a central theme of much of his work, demonstrates this amply. He strenuously believes that it generates exactly such passivity and mindless obedience that we ought to be wary of. For his part, he declares himself an antitheist, one who believes not only that “all religions are the versions of the same untruth”, but who also maintains that the “influence of churches, and the effect of religious belief, is positively harmful.” He observes that life would be miserable if what the faithful affirmed were actually true, calling religion a “divine cradle to grave supervision; a permanent surveillance and monitoring” and deeming it worse than a Big Brother state because there is no hope that it might eventually pass away. And regardless of whether you agree with him or not, his erudition is undeniable. For me, what makes him so appealing is his uncanny ability to make the unlikeliest of arguments seem plausible through a combination of sedulous research, a most felicitous use of the English language, and a devastating argumentative ability. One thing that always strikes me, and will strike any reader, when reading Hitchens is how well read he himself is. When answering the question of what one should read and study, he cautions at the outset that this is no easy query, most importantly because one mustn’t seek out arguments from authority. 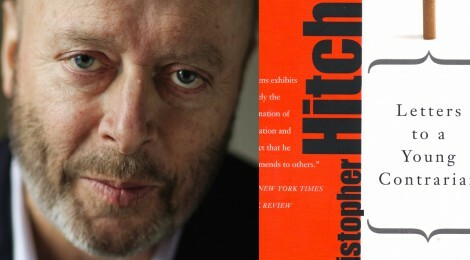 For himself, Hitchens says rather modestly that he makes liberal use of extracts and quotations “not just to show off my reading, but also to lighten the text and make use of those experts who can express my thoughts better than I am able to.­” Mood is an important consideration when talking about reading, for the oppositional and critical mind is not always apt to be principled and engaging. Indeed, it is often faced with a considerable amount of discouragement, and “there are days, even years, when Diogenes has much more appeal than Wilde.” Nonetheless, he offers two great authors who have made great use of cultivating pessimism in their works – Milan Kundera in his seminal novel The Book of Laughter and Forgetting (describing the Russification of Czechoslovakia), and Czeslaw Milosz in his work, The Captive Mind (talking of the Baltic States being erased by Stalinism). And while conceding that he himself has never had to face circumstances as despairing or hopeless as Kundera or Milosz, he does conclude that the it is this moment of near despair that precedes courage rather than resignation, that when one’s back is against the wall, there is only one option left, a realization that he describes as being liberating. Akshay Sreevatsa teaches at a law school in Bangalore. He graduated with a B.A. LL.B. (Hons.) from the National Law School of India University in 2011 and an LL.M. International Law from the University of California, Berkeley in 2014.A devotee of Dylan, the Stones, and everything Blues, he also enjoys reading and mass consuming TV shows like Family Guy and The Simpsons.